Worried this has all been too easy? A fourteen-day challenge tossed off in a mere eleven day? After a dissapointing trip to Anglesey, to a Beaumaris pier that’s being worked on (new struts Davd who works on the ‘i can see it from here’ Bangor pier says) we return to the car to find it not doing what a car should do. Go. It isn’t starting, Midge diagnoses a flat battery or a starter motor problem, so we try a push start—it goes but we have to turn off the radio, the phone charger and the air blower as we need to conserve energy. I offered to sing the songs that came up on the ‘What’s on 6 Music’ Twitter feed, but the mood in the car was too dark for that. It also didn’t seem to want a trip to Portmerrion, the Prisoner fantasy scene from the book will have to come from memory. Stopping for petrol we prayed that the battery was charged enough to get the car going again, it was about to get significantly heavier. It did so we risked the radio, mood lightened, the sun crept out over a valley, and Bret bloody Anderson came on. When we stopped at Aberystwyth, though, no joy. 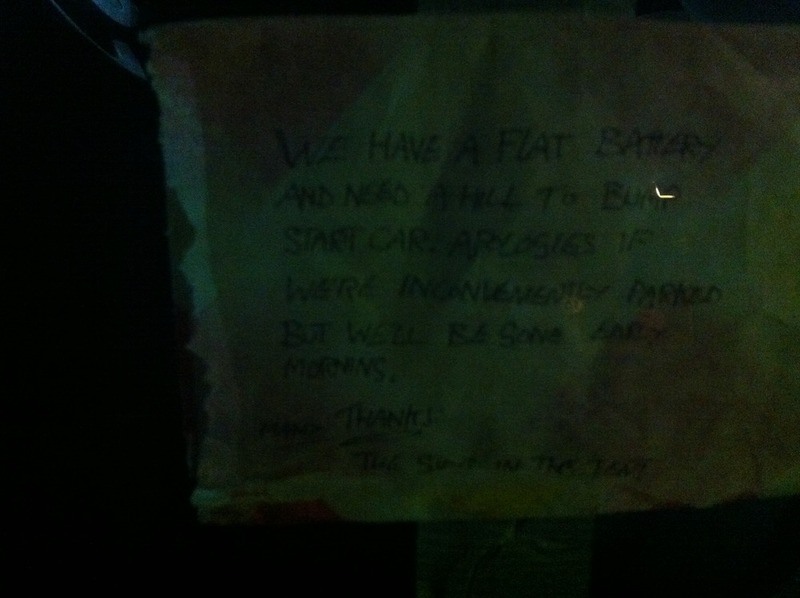 A series of bump-starts on hills gets us to the campsite, where we park on a slope and leave this note. “You can’t park there”, says an otherwise very friendly camp host — so it’s a push in the morning. Uphill. But only two more to go before our own beds.